We replaced the 19mm front anti-rollbar with a 20mm one from the heavier1994 Celica GT. When the 94-99 GTs were being campaigned in what was then E Stock, the trick was to put the smaller ST bar on, to limit inside wheelspin. The bar that we used actually came from Per’s old 94 GT that he ran in E Stock in 1999. If the thinking back then was to put a smaller bar on to limit wheelspin, why put a larger front bar on our stock class autocrosser? Doesn’t that larger bar make understeer worse? Inside wheelspin? Not really, as the bar will limit body roll, which in turn will keep your contact patch more consistent, the end result is increased traction at both ends of the car. The ST doesn’t really have enough power to make wheelspin an issue either. Does it work? 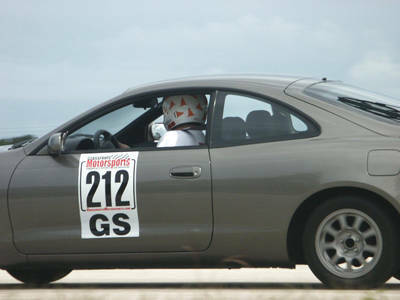 We didn’t have time to do any back to back testing on this modification, but we found out at a local autocross this weekend that the car still feels amazingly responsive in low speed corners. There certainly wasn’t any increase in understeer. 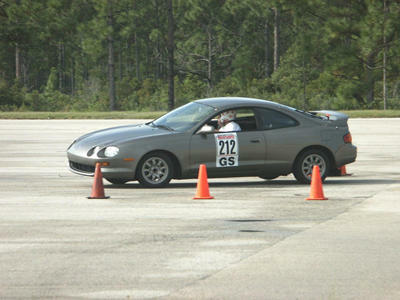 The car also felt more stable through some faster offsets. This will probably be where we see the most improvement with the new bar. To keep things interesting, we are not running in our local region’s G Stock class, For 2003, we’ve switched and started running in “Expert”, a class that is based upon the PAX index. This past weekend’s event is being counted for the 2003 year, oddly enough, so we have our first win of the season under our belts.